Promethium atoms have 61 electrons and the shell structure is 2.8.18.23.8.2. The ground state electronic configuration of neutral promethium is [Xe].4f5.6s2 and the term symbol of promethium is 6H5/2. Promethium: description Your user agent does not support the HTML5 Audio element. Great care is required while handling promethium as a consequence of its radioactivity. Promethium salts luminesce in the dark with a pale blue or greenish glow, due to their high radioactivity. Ion-exchange methods led to the preparation of about 10 g of promethium from atomic reactor fuel processing wastes in early 1963. Little is yet generally known about the properties of metallic promethium. More than 30 promethium compounds have been prepared. Promethium is a rare earth metal. It appears that there is no known Pm existing in the earth's crust. The solid state structure of promethium is: bcc (body-centred cubic). Reactions of promethium as the element with air, water, halogens, acids, and bases where known. Binary compounds with halogens (known as halides), oxygen (known as oxides), hydrogen (known as hydrides), and other compounds of promethium where known. Bond strengths; lattice energies of promethium halides, hydrides, oxides (where known); and reduction potentials where known. 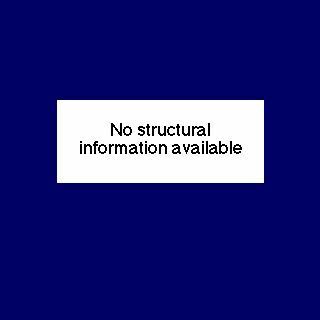 Promethium was discovered by J. A. Marinsky, Lawrence Glendenin, Charles D. Coryell in 1945 at United States. Origin of name: named after "Prometheus" in Greek mythology, who stole fire from the gods. 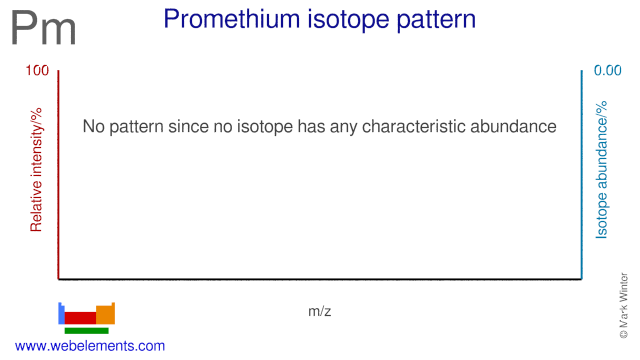 Isotope abundances of promethium with the most intense signal set to 100%. Isolation: promethium metal is available commercially so it is not normally necessary to make it in the laboratory, which is just as well as it is difficult to isolate as the pure metal. This is largely because of the way it is found in nature. The lanthanoids are found in nature in a number of minerals. The most important are xenotime, monazite, and bastnaesite. The first two are orthophosphate minerals LnPO4 (Ln deonotes a mixture of all the lanthanoids except promethium which is vanishingly rare) and the third is a fluoride carbonate LnCO3F. Lanthanoids with even atomic numbers are more common. The most comon lanthanoids in these minerals are, in order, cerium, lanthanum, neodymium, and praseodymium. Monazite also contains thorium and ytrrium which makes handling difficult since thorium and its decomposition products are radioactive. 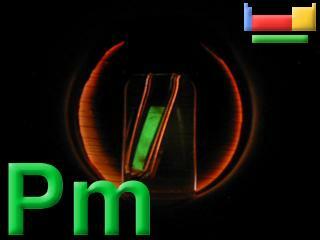 Pure promethium is available through the reduction of PmF3 with calcium metal.